Browsing 5 posts in Web/Tech. In the mid-90's, this was a "must have" for every dental student! I’m a technophile. Which is a really nice way of saying that I’m a sucker for a cool gadget. I had my first laptop in 1993 (an Apple Powerbook 160) and used it to take notes in dental school. 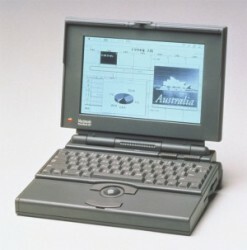 It was an absolute clunker and had a greyscale screen, but I loved it. I carried that cinder block around like newborn baby! Dentistry is a profession that has LOTS of gadgets. In fact, there’s so many gadgets that a dentist really needs to be wise about choosing technology. Many times in my career I’ve brought in a technology that was marketed brilliantly but wasn’t very helpful to patients. 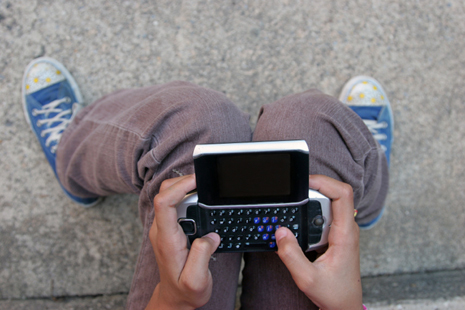 I’ve become more choosy about the technology I incorporate as I’ve matured in my career. Technologies that involve magnification and imaging (taking pictures) are very important to me. I use high powered loupes and an LED headlamp for all procedures and exams, unless I’m using my dental operating microscope. We also have intraoral cameras in each operatory and a digital SLR camera. 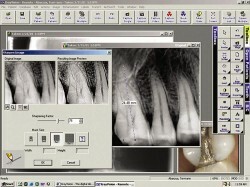 These technologies also lend themselves to taking photos of procedures and conditions and being able to explain dental problems and proposed treatments using digital photos. Along those similar lines, our office has been using digital x-ray technology since 2007. Digital x-rays are a cool technology for many reasons. First, how neat is it that we can snap an x-ray of your tooth and it appears on a computer screen in a matter of seconds? I don’t care who you are, that’s just cool! Software allows us to change the size, crop and zoom and even accentuate the image in a way that we never could when we were using film. Further, the image is on a huge computer screen instead of a tiny film. And if that wasn’t enough, digital x-rays use only 20% (or less) radiation than film x-rays! So, I can make digital photos and digital x-rays of teeth. It’s very convenient and very cool. Here at Mead Family Dental, we’ve taken it one step further. 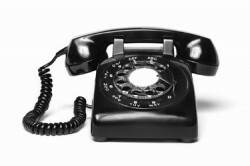 We use the technology to save you money! Let’s just say you’re my patient and you’ve come in to have your teeth cleaned. When I do your exam I find a raised white patch on the side of your tongue. Now I’ve seen quite a few tongues in my career, but my training is limited in the identification of these kind of lesions. So what do I do? I typically send you to a specialist. In this case, I’d send you to an oral surgeon. The surgeon would first schedule you to examine the spot and then would decide if there is a need to biopsy the lesion. In many cases, the surgeon has had enough experience seeing this kind of pathology that a photo or x-ray would be enough for them to decide whether it’s something that can be monitored or it’s something that needs to be examined in their office. So now we come back to our slick digital technology. I’ve already taken several photos of this suspicious white patch on your tongue. I email the photos along with a description of the lesion. Usually within a few hours or at most a day or two I get an answer back from the surgeon saying, “I think we can monitor this until their next visit” or “we should probably set up an appointment in our office.” What I did was get an opinion from a specialist without you having to visit the specialist. I do this all the time. Consulting specialists has become much simpler and in many cases much less expensive because of the technology that we have at the office. Technology in medicine is constantly evolving. Here at Mead Family Dental, we’re trying to choose the technologies that make our patient care better, more efficient and more cost conscious. Doing what’s best for our patients is our #1 goal! If you like this post, I’d love to hear about it! 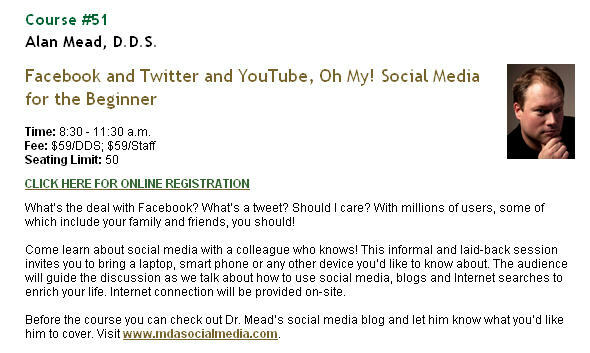 You can share any Mead Family Dental post with a “Like” on Facebook, a “+1″ on Google+ or you can even “Tweet” it with Twitter! All you need to do is hover over the heart shaped button next to the title of the post. Or you can leave a comment by clicking on the balloon shaped icon next to the title. The social media site known as Google+ has just added the ability to have a business page. 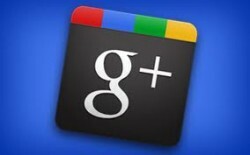 So if you’re on Google+ go check out our Mead Family Dental page. While you’re there, give us a “+1!” So far, it’s not much. But we’ll be putting up cool photos and content in the future! You can find us on Facebook, too! If you haven’t already, “like” us on Facebook for up to date Mead Family Dental stuff! Dentists, dental team members, etc…you really should come to this! My only answer: now you can! Just ask for a guest log in and password and you can merge into the information superhighway and have your teeth whitened at the same time!